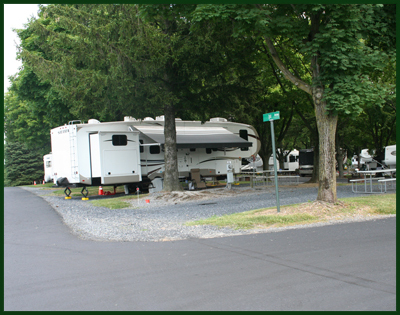 We are in beautiful south central Pennsylvania and easily accessible to the Pa Turnpike and interstates 81,83,283 and route 322. Our guests enjoy a relaxing camping experience with the benefit of being in close proximity to exciting and historic places throughout the year. We are minutes away from Hershey Park, The Farm Show Complex and the State Capitol. You can drive to Gettysburg, Lancaster and York in under and hour. We are also minutes away from Bass Pro Shop, Field and Stream, Camping World, Etnoyer's RV Supplies, Walmart and Target just to mention a few. The Pa Farm Show Complex, The Giant Center, The Forum, Sunoco Performance Theater and Hershey Theater bring many top attractions. Car Events at both Hershey and Carlisle Fair Grounds occur all year long. 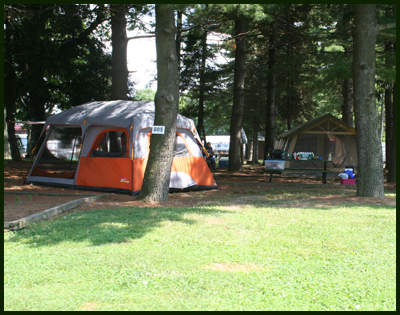 We have tree shaded pull thru sites for larger RV's and a cozy tent area with a tall evergreen canopy.